College of Science and Engineering, University of Glasgow. MSc, Durham University in 1967. 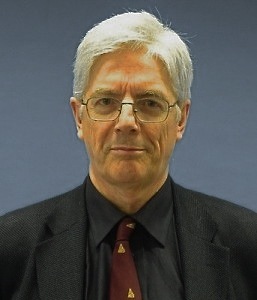 PhD in 1969 from the University of Warwick, involved analytical and Monte Carlo studies of non-equilibrium transport phenomena in semiconductors. During 1969-70 held a SRC Personal Research Fellowship in thePhysics Department at the University of Warwick to develop the quantum transport theory of the magnetophonon effect. Appointed to a lectureship in Theoretical Physics in University of Warwick in October 1970. Long standing interest in theoretical physics, philosophy of science, astronomy, computational methods, device modelling and electron transport theory which go back to early work on hot electron physics and the quantum transport theory of semiconductors. During the late 1970’s worked at the IBM T.J. Watson Laboratory, Yorktown Heights, North Texas University and Colorado State University where began investigations into the physics and modelling of ultra-small and low-dimensional semiconductor devices and structures. Affiliate Professor of Physics at Colorado State University from 1979-1983. In 1985, appointed as a Professor of Electronics in the Department of Electronics and Electrical Engineering, University of Glasgow where became a co-founder of the Nanoelectronics Research Centre (and Theory and Modelling Group) at Glasgow University. In 1990 elected Fellow of the Royal Society of Edinburgh (became Convenor of the Mathematics section and later Convenor of the Electronics and Electrical Engineeering Division). Member/chairman of a number of SERC and EPSRC committees. Fellow of the Royal Astronomical Society and Fellow of the British Interplanetary Society. Affiliate member of the Institute of Physics. Member (Treasurer) of the Nomads Club, Glasgow. Vice-President of the Council of the Royal Philosophical Society of Glasgow. Current research projects include studies in single electronics, quantum trajectories, quantum traffic theory, quantum transport theory, Non-equilibrium Green function theory, silicon-germanium HMOS devices, semiconductor device modelling, Monte Carlo simulation, molecular electronics, nanoelectronics, parallel computer architectures, confocal microscopy of arteries, impact craters, artificial olfaction, smart dust, computer vision and pattern recognition. Published over 370 scientific papers.